Howdy, folks! The loyal readers among you know, that we not only review Android Games, we have also a thing for other gaming platforms or even non-gaming content like EZ Notes or Otaku-ket. 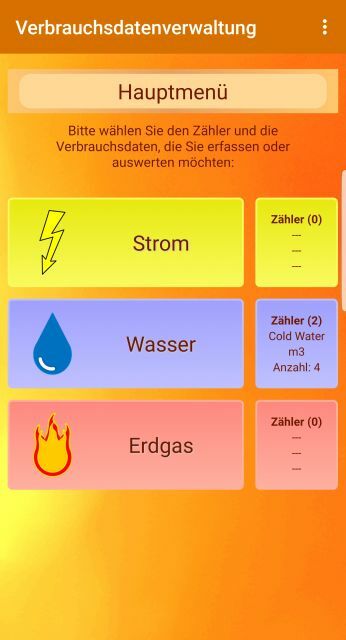 Today, I’m going to take a look at an app, that is as un-playful and mature as an app can be: It’s a consumption data manager, in which all counter-based consumables like electric power, natural gas or hot/cold water can be tracked and analyzed. In these times, where more and more people realize the limitedness of natural resources (well, everyone except Donald Trump), this app can help us to save money and the planet. Let’s dive in! I’ve decided to test the app by using the data of our two water counters, that (presumedly) display the amount of hot and cold water, that is being used in our apartment. Entering the data is easy and intuitive, as you just have to tap on the right icon and enter a date, time and the actual count. At any time, the app is able to analyze your consumption and processes the given data into diagrams. Although this obviously makes more sense, if you’ve tracked more than just a few days like in my case, it’s still extremely interesting to see the course of the curve. 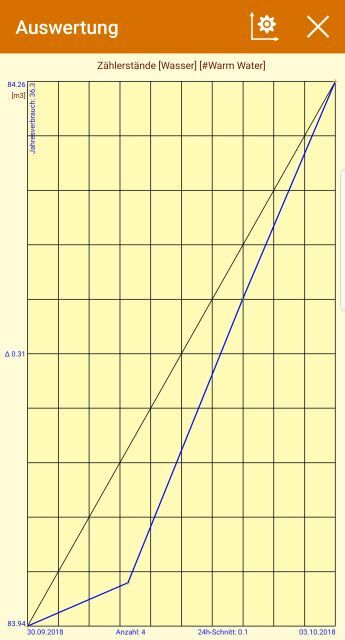 Big plus: The app calculates the yearly consumption and displays the forecast in the diagram. I know, power management is a rather dry topic. But does that automatically have to lead to fonts, buttons, colors, and graphics, that look like a reminiscence of Windows 95? I’d suggest to juice up the appearance of the app, not despite but because of the content. It doesn’t need flashy animations, but a clean, solid, straight and elegant design would do wonders here. Plus, the menu navigation is not the best example of user-friendly and -oriented app design. For example, to add a new counter, you can’t just click on counter in the main menu (which you would intuitively do. Which I even did after I already knew how to add one), you have to 1) click on the three dots on the upper right screen, 2) click on options and 3) click on managing counters to finally reach the point, where you want to be. That’s a bit fiddly and inconvenient, isn’t it? But thankfully it’s something that can be improved rather easily. Regardless its design or its menu guidance, the “Consumption Data Manager” is a useful and mighty tool to improve your energy usage. Download it here. Fred, ich komme nicht mehr auf Fettspielen.de!!! Wie soll ich jetzt Gosu werden?? ?